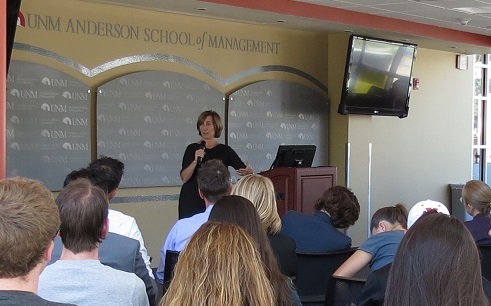 The UNM Department of Political Science and the Student Center for the Public Trust, in cooperation with the Thornburg Foundation, recently presented a conversation with Ann Ravel, Chair of the Federal Elections Commission at the Anderson School of Management on Friday, September 18. Ravel discussed the impact of money in politics, touching on its occurrences at the federal level, how the lack of transparency in donations can lead to corruption, the cost to the public, and what needs to be done to address this problem. It’s a problem that is also felt here in our state. The Washington Post reported that a 2012 report from the Center for Public Integrity gave New Mexico a grade of D-. This lack of integrity has a lasting impact on every New Mexican. The Federal Election Commission is an independent regulatory agency created to administer and enforce campaign finance laws in the U.S. Ravel was appointed in 2013 to the commission by President Obama. She served as the head of the California Fair Political Practices Commission where she conducted a year-long investigation into ethics and conflicts of interest related to the methods used by political campaigns, office holders and political officials to extort money and contributions from local businesses.